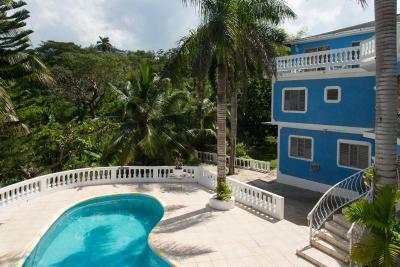 Offering an outdoor pool and a terrace, Chateau Margarie Bed and Breakfast is located 1.7 mi from Great River Bay and 6.8 mi from Montego Bay. It features free parking. Each room here will provide you with a TV, air conditioning and a balcony. The private bathroom comes with a bath or shower. You can enjoy a sea view and mountain view from the room, as well as free WiFi. At Chateau Margarite Bed and Breakfast you will find a garden and barbecue facilities. Other facilities offered at the property include a shared lounge, dry cleaning and an ironing service. Sangster International Airport is 9.9 mi away. When would you like to stay at Chateau Margarite Bed and Breakfast? Nice, Clean, Peaceful and spacious are just a few words to describe this elegant resort with pool and right next to the beach. House Rules Chateau Margarite Bed and Breakfast takes special requests – add in the next step! Chateau Margarite Bed and Breakfast accepts these cards and reserves the right to temporarily hold an amount prior to arrival. We need at least 5 reviews before we can calculate a review score. If you book and review your stay, you can help Chateau Margarite Bed and Breakfast meet this goal.